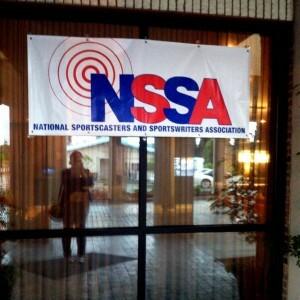 This is the only known photo of me at NSSA weekend. Last week I had the pleasure of matching faces to the names of STAA clients I’ve corresponded with for years. Because my communication with clients is overwhelmingly conducted via email, it’s particularly fun for me to connect with you in person. Several of you asked me a question that I’m rarely posed: how did you start working for STAA? Most people don’t know this, but once upon a time, I thought I might want to be a sports broadcaster. I was an intern and producer for the international radio show Inside Soccer, while also a student at Palomar College in San Diego. After encouragement from a couple of PC friends, I signed up for the new sports broadcasting class taught by Jon Chelesnik. For three semesters, I had the opportunity to get the kind of coaching and advice that our clients receive, but in a classroom setting. When the co-hosts of Inside Soccer asked me fill-in as lead host, Jon was the person I asked for help in figuring out how to prepare and organize a four hour show (thank you topic tree). As an aside, hosting the show twice gave me a healthy respect for hosts. Four hours is a long show. At some point, Jon found out I knew HTML. From that point forward, he would sometimes bring coding questions and we’d work them out on the board before class. What I didn’t know at the time was that Jon was just starting STAA and building the website himself. Then I transferred to Biola University and helped relaunch the school radio station, relying on my notes from Jon’s class to teach broadcasting principles to our rookie staff (most sportscasting principles can be applied more broadly to other genres of radio). While at Biola, Jon called with a part-time job offer to work on the STAA website. It was perfect timing, and the perfect situation for a busy college student. The rest, as the saying goes, is history. Over the last seven years, my responsibilities at STAA have grown into a collection of hats that vary widely from the technical website backend stuff, to laying out how STAA interacts with the sports broadcasting community. This job is nowhere close to what I imagined my post-college work life might be, but that is a great thing. Last week, and at ODT events past, many of you introduced yourselves to me with a variation on “you probably don’t remember me, but…” Every time it happened, I felt a little sad because maybe that means you thought I wouldn’t care enough to know your name. The truth is, if we’ve interacted via email more than once, I remember you. I consider it a privilege that my job is essentially to help you chase the dream (no matter how indirect my role is). I admire your tenacity in pursuing a career that many would tell you is too all-consuming, too risky, or too foolish to be a viable “grown up” option. When your name and story goes up under the “STAA clients get sportscasting jobs” banner, I get excited. Not just because I know you, but also because I understand a little about how hard you had to work to get there. You are very well appreciated and a very humble soul…..thank you for all your hard work in making dreams come true…..